For evidence that algorithms have reshaped our most fundamental financial systems, look no further than the quiet floor of the New York Stock Exchange. Once a chaotic scene of shouting traders, the floor is used more today as a backdrop for television interviews than trades. In the not so distant future, drivers, cashiers, even journalists may go the way of the floor trader, replaced by intelligent algorithms that can do the same job faster, cheaper and, potentially, safer. How will this impact our economy and job market? How are financial institutions evolving in this computational environment? How vulnerable is this new system to attack? 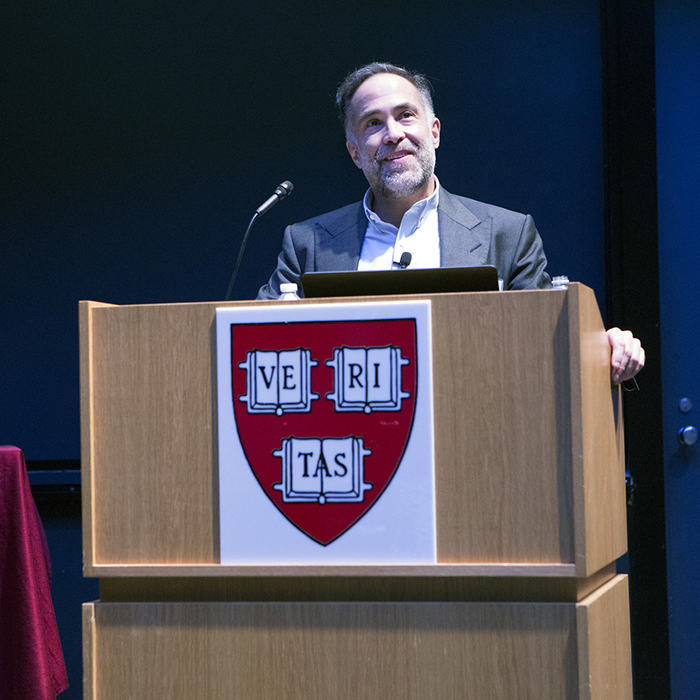 These were some of the questions explored during “Data, Dollars and Algorithms: The Computational Economy,” a daylong symposium hosted by the Institute for Applied Computational Science (IACS) at the Harvard John A. Paulson School of Engineering and Applied Sciences. The annual symposium marks the culmination of two weeks of events at IACS called ComputeFest. Those implications are already being felt in various industries. R. Martin Chavez, ’85, SM ’85, Chief Financial Officer at Goldman Sachs, spoke about how the financial giant has evolved in his decades with the company. Now, one in three Goldman Sachs employees are engineers, Chavez said. Financial security in the age of algorithms was brought up again and again. Several speakers encouraged students in attendance to be aware of how computer science intersects with other parts of society, especially law and government. “We need people who are writing the code to be aware of not only the algorithmic details of market but also the regulatory details of markets, the economic details and the legal details,” said Eric Budish, Professor of Economics at the University of Chicago, during a panel discussion led by PBS News Hour economics reporter Paul Solman. Budish spoke about the unintended consequences of algorithms in the change from human to machine trading — the rise of high-frequency trading and the billions of dollars that can be made in the split second it takes for information to move from one place to another. Another consequence of the algorithmic arms race is the loss of human jobs, said Keith Chen, associate professor of economics at UCLA and former economist with Uber. Chen reminded the audience to weigh the pros and cons of the algorithmic economy. Self-driving cars could help decrease the number of people killed in car accidents every year. At the same time, they could also put millions out of work. “It is incumbent on us to think about how these gains in artificial intelligence can be used in a way where the benefits are distributed evenly and with minimal disruption to the larger society,” said Chen. The event was co-organized by Brian Hayes, associate in computer science at SEAS, Pavlos Protopapas, scientific program director at IACS and Neil Shephard, professor of economics and statistics at Harvard. Other speakers included Aviv Zohar of Hebrew University who spoke about Bitcoin; Tuomas Sandholm of Carnegie Mellon University, who spoke about using algorithms to match kidney donors; and Serena Ng of Columbia University, who spoke about big data. Full video of the symposium can be found here.